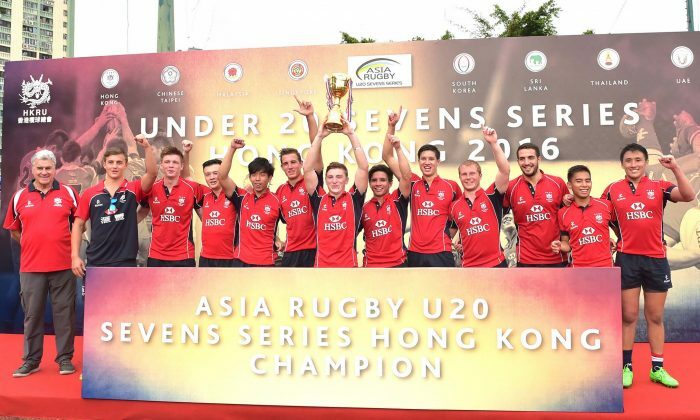 HONG KONG—A restructured Hong Kong team put up a strong performance in the 2nd leg of the Asia U20 7’s series held at King’s Park, Hong Kong on Friday Aug 12 and Saturday Aug 13 with veteran members of the team Daniel Archer and Cameron Smith leading the way. Hong Kong powered through the Pool matches winning against Singapore (36-5), UAE (40-5) and South Korea (33-9 to finish top of Pool B. South Korea also put in a strong performance in the Pool matches winning their earlier two matches against UAE and Singapore with ease to finish second in the group. Sri Lanka topped Pool A with wins against Taiwan (36-12), Thailand (40-5) and Malaysia (40-5). Malaysia beat Thailand (42-0) and Taiwan (22-19) to finish runners up in Pool A. These 4 teams contested the Cup semi-finals with Sri Lanka beating South Korea (19-12) and Hong Kong outplaying Malaysia (26-14) including a try on the last play of the game. UAE won the Plate final against Taiwan 24-12 and South Korea outplayed Malaysia to finish in 3rd place in the tournament. In the Cup final Hong Kong again put in a strong organized performance demonstrating good distribution, excellent ball handling and some fast elusive running with the ball to keep Sri Lanka on the back foot. Although Sri Lanka had two break away tries Hong Kong strode away with the game with 6 tries and some good conversion kicking. Hong Kong won the final 36-10. James Karton opened the scoring in the first minute and this was well converted for a 7 point lead. Daniel Archer made it 12-0 and a good conversion made the score 14-0. Archer touched down again to make the score 18-0 at half-time. Hong Kong stretched their lead to 31-0 with scores by Cameron Smith before Sri Lanka went over for their 1st points. Archer scored again to take the score to 36-5, but Sri Lanka scored a late try for a 36-10 result. “Our performance in the final was superb. We started really well and got on the board early. From there on out, our re-starts, our handling, our rucking, everything was really precise. We just starved them of possession. I think Sri Lanka only had the ball for about 30 seconds in the first half,” said Hong Kong Coach Fan Shun-kei. “We scored again to start the second half and then the tries kept coming. Once we put up a good margin we were able to get more fresh legs from the bench on and were able to close it out easily,” Fan said. “Our two veterans, Daniel (Archer) and Cameron (Smith), really led from the front this week, but the credit has to go to a very solid team performance from top to bottom. I am really happy at how the schoolboy players performed,” Fan added. The Series Cup, was won by Sri Lanka after winning the Johor Bahru 7’s and finishing as runners up in Hong Kong. Thailand U20 women won the 3-way mini-series against Hong Kong 2-1 and also secured the 2-leg series title. The Hong Kong U20 women put on a good final display to win the 3rd match against Thailand.